The female is usually fatter than a male of the same age. The male will grow bristles along his cheeks, but sometimes these aren't visible, however the cheek area will have darker colouration where the bristles will be. Peaceful, will happily co-habit with other fish that won't compete for food and grazing areas. Should not be kept with very boisterous fish or fish that may fin nip. Needs a vegetable-based diet including algae, catfish wafers, blanched vegetables and bogwood. Also occasional likes meaty food such as brine shrimp and mosquito larvae. As these are mostly nocturnal feed them quite late at night. Sometimes you will see them during the day looking for food. Do not leave them to eat algae off the tank only as this will not sustain them. Requires a mature spacious tank with plenty of hiding places for them to hide during the day. The tank should be very well filtered with highly oxygenated water, the originate from fast flowing streams in the wild. They are planted tank friendly and prefer warm temperatures of around 26-29°C (78.8-84.2°F) . They do not swim as such, but tend to 'walk' on their fins. Sometimes they will glide gracefully from tank side to substrate. They can be nervous and shy. Eggs are spawned on a smooth surface in a good flow of water - usually the side of the tank opposite the filter. Eggs hatch after 6-8 days and the fry will start to graze after 1 or 2 days. The male looks after the eggs until they have hatched. It is not normal for the female to eat the fry. Dramatic-looking elongated slender catfish. Very thin tail which has a long trailing fin extension from the upper caudal lobe. Colouration is mottled brown and creamy yellow with black horizontal markings behind the first dorsal ray. 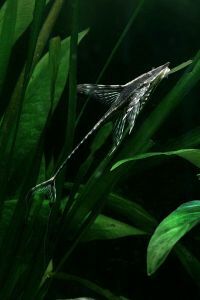 One of the smallest of the Whiptail Catfish, this Whiptail can look similar to the Sturiosoma panamense. This page was last edited on 14 March 2018, at 13:03.